This listing is for One Brand New RawTherapee Digital Photo Editing Software Installation Disc for Windows with PDF User guide Included. This disc will include both the 32 Bit 64 Bit Windows versions for your convenience. The 32 Bit version is compatible with Windows XP/Vista/7, and the 64 Bit version is compatible with Windows Vista/7. RawTherapee is a great RAW Image processing program equipped with the essential tools for high quality and efficient RAW photo development. 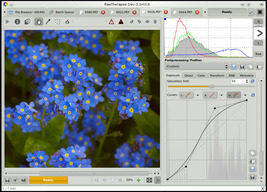 Features RawTherapee involves the concept of non-destructive editing, similar to that of some other raw conversion software. 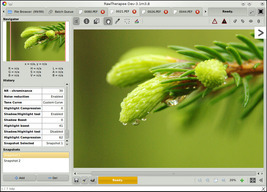 Adjustments made by the user are immediately reflected in the preview image, though they are not physically applied to the opened image but the parameters are saved to a separate sidecar file. These adjustments are then applied during the export process. All the internal processing is done in a high precision 32 bit floating point engine. Input file formats RawTherapee can work with both raw files from digital cameras and common images. While reading raw files it relies on the dcraw code, but only for parsing formats, not for processing. Thus, RawTherapee supports all the formats supported by dcraw. 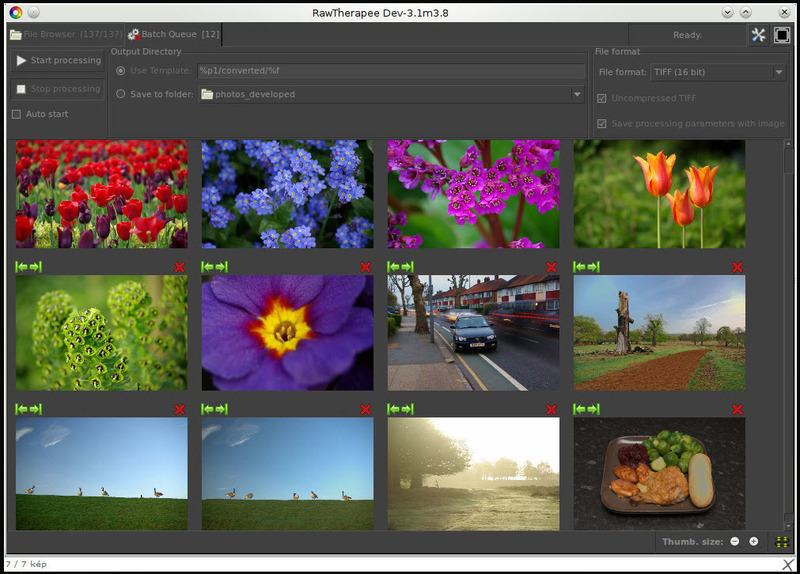 Additionally, RawTherapee supports the following image formats: · JPEG · TIFF · PNG User interface RawTherapee provides the user with a file browser, a queue, and an image editing tab. The file browser shows photo thumbnails along with a caption of the shooting information metadata. The browser includes 5-star rating, flagging, and an Exif-based filter. It can be used to apply a profile, or parts of a profile, to a whole selection of photos in one operation. The queue tab allows one to put exporting photos on hold until done adjusting them in the Editor, so that CPU is fully available to the user while tweaking a photo, instead of processing photos while the user is trying to tweak new ones which could result in a sluggish interface. Alternatively, it can be used to process photos alongside tweaking new ones, if one has a CPU capable of handling the workload. The Editor tab is where the user tweaks photos. 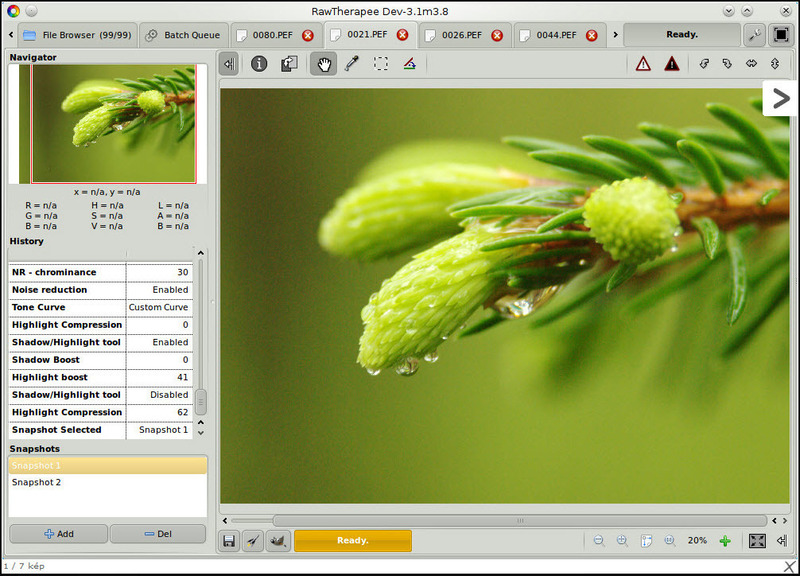 While the image is opened for editing, the user is provided with a preview window with pan and zoom capabilities. A color histogram is also present offering linear and logarithmic scales, and separate R, G, B and L channels. All adjustments are reflected in the history queue and the user can revert any of the changes at any time. There is also the possibility of taking multiple snapshots of the history queue, allowing for various versions of the image being shown. These snapshots are not written to the sidecar file and are subsequently lost once the photo has been closed, however work is underway on migrating the PP3 sidecar system to XMP which already supports storing snapshots. Adjustment tools and processing · Demosaicing. User can choose from EAHD, HPHD, VNG-4, DCB, AMaZE, AHD, fast and bilinear algorithms. · Processing profiles support with the ability to load, save and copy profiles between images. · Exposure control allowing manipulation of exposure compensation, brightness, highlight recovery, shadow recovery, brightness, contrast and saturation. · Advanced highlight reconstruction algorithms and shadow/highlight controls. · RGB and Lab curves · Various methods of sharpening · Various methods of noise reduction · Detail recovery · White balance (presets, color temperature, spot white balance and auto white balance) · Channel mixer · Color boost and vibrance (saturation control with the option of preserving natural skin tones) · Hue, saturation and value adjustments using curves · Tone mapping using edge-preserving decomposition · ICC color profiles (input, working and output) · DCP color profiles (input) · Adobe Lens Correction Profiles (LCP) · Crop · Resize · Rotation with visual straightening tool · Distortion correction · Perspective adjustment · Manual and automatic chromatic aberration correction · Vignetting correction with adjustable center offset · Dark frame subtraction · Flat field removal (hue shifts, dust removal, vignetting correction) · Hot and dead pixel filter · Metadata (Exif and IPTC) editor · Processing queue Output formats Output format can be selected from: · TIFF (8 and 16 bit) · JPEG (8 bit) · PNG (8 and 16 bit) High Image Quality · Get the most details and least artifacts from your raw photos thanks to modern and traditional demosaicing algorithms: AMaZE, DCB, fast, AHD, EAHD, HPHD VNG4. 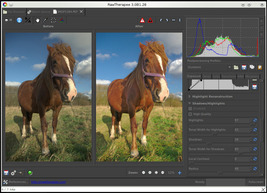 · Advanced color handling from white balance to HSV (Hue-Saturation-Value) curves and color management. 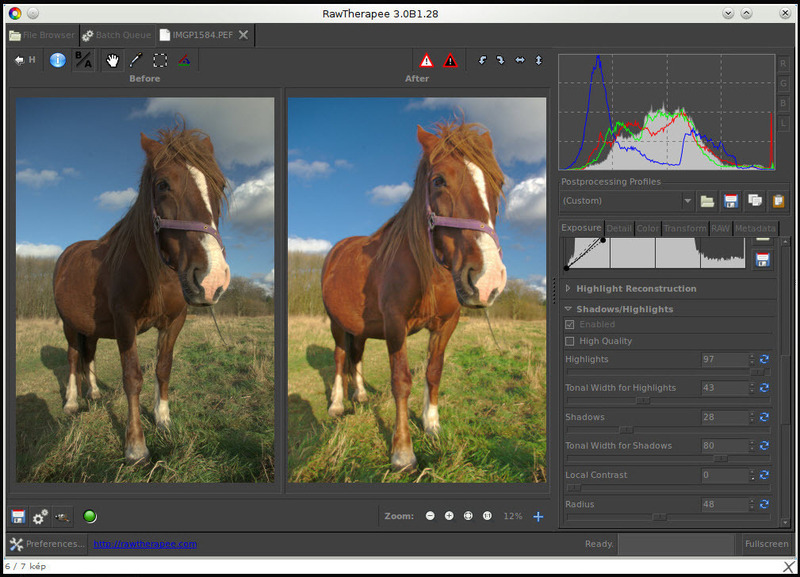 · Enhanced exposure and tonality tools: tone and Lab curves, highlights and shadows tools, etc. · Multiple denoising methods: luminance, chrominance, impulse (for salt and pepper noise) noise reduction. 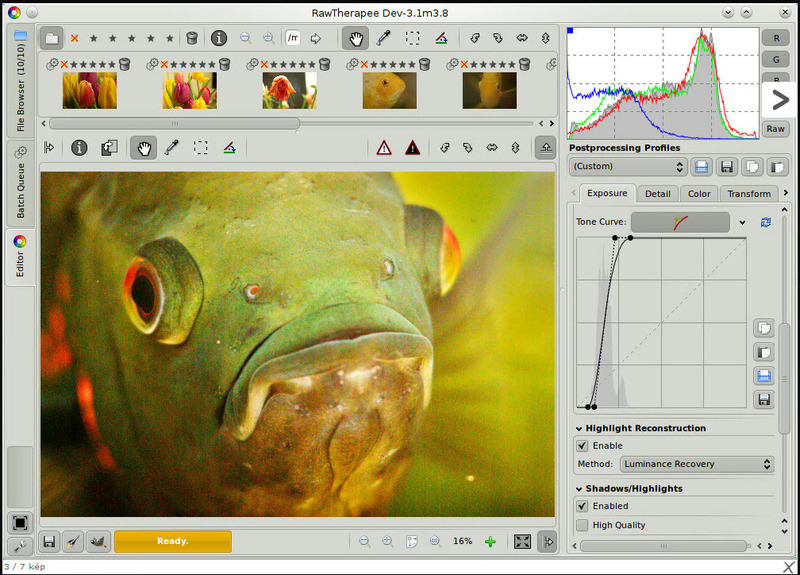 · Several tools to enhance details: unsharp mask, RL deconvolution, contrast by detail levels. Efficiency · Multi-threaded algorithms for high performance (RawTherapee can utilize modern processor features). · Quick thumbnails load lightning fast and are replaced later with live thumbnails · Batch processing: convert all the developed images at once without loading the processor while you work. · Basic tools immediately at your hands. 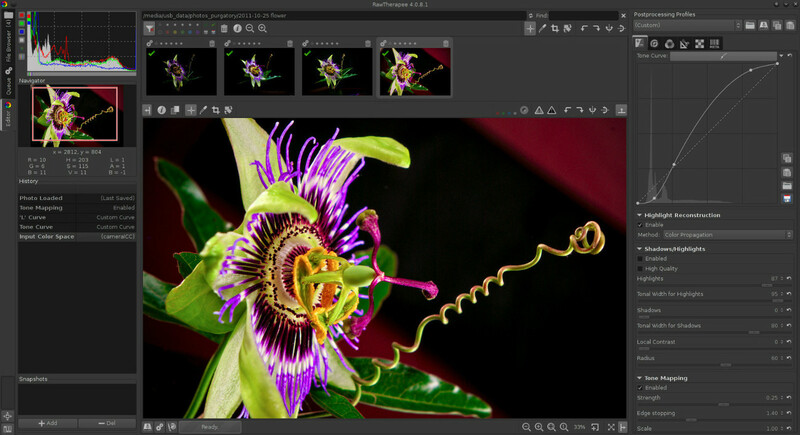 · Parallel editing of multiple images. · An optional secondary display can be used. Versatility · Wide variety of supported cameras: almost all DSLRs and even some medium format bodies are supported. · Advanced control over the algorithms with many fine-tuning parameters. · Command line usage besides the normal graphical interface. · Various layouts: multiple tabs, single tab with filmstrip, vertical tab with filmstrip. ****This is not a boot limited, OEM, shareware, bootleg or trial version, No activation or CD key is required to take full advantage of this software. CD-ROM set does not come in a retail box as it is Open Source software. Installation is as simple as inserting the CD in your computer. All the software programs included in this listing and included on these CD-ROM's are Open Source, not "freeware" or "shareware", and fall under the terms of the GNU Public License, and the GNU Lesser General Public License (LGPL). No copyright or trademark laws have been infringed. This product is in full compliance and full accordance to Media Policy and Unauthorized Copies Policy. Thanks for Looking! Please listing with confidence, I only sell items that I would be proud to purchase myself!